There are many potential problems with garage doors, but the most common problem is the failure of one of the garage door springs. Torsion springs, which run along a bar above a closed door should never be replaced by a homeowner unless they have had specific training. To solve broken spring problems just give us a call at 334-577-4169. We are always available for free phone consultations and we love helping people fix their garage doors. Your overhead garage door is extremely heavy. Neither you nor your garage door opener can open your door without the help of the springs that you can see directly above the door when it is closed. These springs are called torsion springs. The problem with these springs is that they fail approximately every 10,000 cycles of your garage door. That means if you open and close your door twice a day that your springs will fail once every thirteen years. The thirteen years comes around pretty quickly for a lot of people. If you’re mechanically inclined and like to work around your house you may be tempted to replace the springs yourself. But take this as a warning. Unless you have been specifically trained in the process of removing and replacing your garage door springs – Don’t Even Think About It. Your garage door may use extension springs. These springs run along the horizontal section of the track. These springs break as well, however if you’re so inclined, you may possibly replace these springs. The problem is that it may take the help of your springs to raise your door. Since your spring is broken, it may be difficult to do. Some lighter doors can be pulled up without springs, then they need to be clamped off to work on the spring. 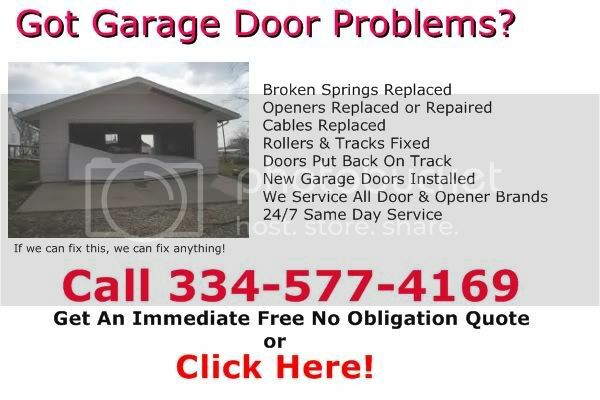 you should call 334-577-4169 and talk to the folks at Phenix City Garage Door Service about having your springs replaced. They’ll come out, replace your springs and check for any other problems your door may have. You’ll find that the slight additional cost between buying the springs yourself and having a service company buy the springs and install them is well worth it.